It is very hard to get into the boating spirit when shoveling snow has been the activity of note. Just to give it a try, I went to visit “Route 66” in her winter lodging which is a tent-like structure in a field in North-East Kelowna. She looked very forlorn and lonely. The life jackets were hanging safely and the bounce sheets ( the best anti-rodent product ) were doing their job. Let’s hope we have a smoke free summer in 2019 and we get to spend a lot more time on the water. Your executive is always at work during the off season and with very little to report about boating activities, I will give you some of the details that were covered during our executive meeting on November 22nd. Every year, the Presidents of the ACBS chapters are asked to select a member of their chapter to receive “The President’s Cup” in recognition of service to the chapter. The cup is a lovely silver cup on a wooden base and is supplied by the ACBS. This year, I am pleased to tell you that the winner was Steve Leslie. Steve is the newest member of our board and has brought new ideas and great enthusiasm with him. Our club thanks you so much Steve for your service to our hobby and in particular, to our chapter. The ACBS ran a lottery during the last season to raise money for student education relating to all things to do with Antique and classic boats. We bought tickets in support of this lottery and we won $400.00 US. You board decided the winnings could be well used in developing a program aimed at youth in Canada, particularly in the Okanagan where we could tie in with the SS Sicamous and their facility in Penticton. This could be the building of a punt or a restoration project in need of help. More on this later. Many of you will remember Peter & Edith Wright. founding members of our chapter and fabulous contributors to the success of the OACBS through their tireless efforts and many hours of service. Edith passed away a few years ago but not before she was recognised by the ACBS with the Mary Herwig award that is presented to only one member of the ACBS per year. Our board decided that Peter should be recognised as well and we have given him a lifetime membership in our club. He has moved from Kelowna and is now back in his old stomping grounds of Burns Lake. We lost touch for a while but I am pleased to say that he is very well and he still has his 1959, 23’ Lyman runabout called Blue Moon and a homebuilt runabout, (not a truck but a true Peterbuilt), with a 30HP Evinrude. . Great to get back in touch. He does not use the internet so if you want to connect again with him, is number is 250-694-3454 and address is Box 68, South Bank, BC, V0J 2P0. Our membership is holding at 34 and our events are holding at two (2), both being boat shows. We have a one day show at Peachland on the Sunday of the May long weekend and our three day show in Penticton, the last weekend of September. (Mark your calendars). We discussed the challenges facing our membership and our board participation. We are “geographically challenged” when it comes to growing our membership as we are covering 3 Provinces and it is hard to hold social events or shop tours that would be accessible to all. Ideas on growing membership are most welcome. *Bruce Wilson – 250-859-7378 - *Jim Cooper – 250-809-9294 - *Bruce Middleton – 250-762-0001 - * Glenda Middleton – 250-861-7822 - * Tyson Konecny – 778-288-1959 – *Steve Leslie – 778-835-9813. Have a safe winter season and let’s hope for a smoke free summer with some great boating. We asked members to tell us how their boats got their names and here’s a few. Sent in by Tyson Konecny…. People always ask me what the meaning behind the name “Muzzy” is. Quite often actually. So this is the story I tell em. As it turned out, Muzzy, was named after Terry Muzzy. He was a friend of Jamies’, that was killed in a motor vehicle accident back in 2006. Jamie named the boat after him. He game me a bit of a rundown on Terry, which I will do here as well, in a minute. Turns out Terry was a pretty good fella. So I told Jamie, “I won’t change it, in honor of your friend.” He seemed pretty happy with that. Here’s a little about Terry. “Terry Muzzy, the Student Assistant Specialist for the Downingtown School District, was killed tragically in an automobile accident early in 2006. During his 16-year tenure, Terry–who was affectionately known as “Muz”–counseled students through a variety of personal crises, saving lives in the process. Terry’s tireless efforts influenced countless teens and families sparing them the devastation of drug addiction, alcohol abuse, and other life endangering events. Through his kid-first mentality and immutable character, Terry made sure that each student received the help they needed when they needed it. So, yah, it’s an honor to keep this fellas name on my boat. 17’, Chris Craft Special Runabout. This is my first boat. It was a shipwreck when we bought it and I did a 3 year full restoration on it. My wife Louise, thought I was crazy and couldn't understand why I had to have a boat. But she does understand my consuming, obsessive, compulsive, behavior . She puts up with a lot so I wanted to name the boat after her but she wouldn’t have it! So how do you name the boat after her without putting her name on it? Well… Lulu Belle is what her Dad called her when she was little. Want your boat to be featured on “What’s in a Name”? The Capri is a 1956 21 ft hull #161. I obtained it through Absolute Classic in Kelowna. They acted as a broker for a consignee from Kelowna. The boat package also included 2 crates with engine parts, transmissions, etc. I have followed Don Danenberg's "bible" religiously and found it a big help. Also, the people who have gone through this process that we have met at the docks, at ACBS Coeur d'Alene, Port Townsend Wooden Boat Show, have also been a huge help for specific problems. The Middleton Brothers have also been a big help. One of my goals was "no epoxy - anywhere" therefore many tubes (many cases) of 5200 used. While the boat reconstruction was taking place engines and parts, etc were delivered to Island D Automotive, Nanaimo, BC for total rebuild. One of the engine blocks had huge cracks in the cylinders so it was useless. The "good" block I decided, to bore out to .030" over. This was done on a Friday evening and come Monday morning there was rust in the cylinders which made it apparent there was leakage through from the water passages in the cooling system. It was apparent that this could not be repaired therefore the search was on for a third block. After a short time a freshwater block was located in the lower mainland, which was sound and good for rebuild. Once again, bored out to .030" over to transform it from a 331 cu in to a 354 cu in. Out of the factory this engine had a compression ration of 7.2 to 1 which we didn't feel adequate. The idea was to create more power and still have it stock on the outside. 9.5 to 1 pistons and all connecting rods, bearings, etc were replaced with new. Also, lumpier cam shaft for a little more "go." 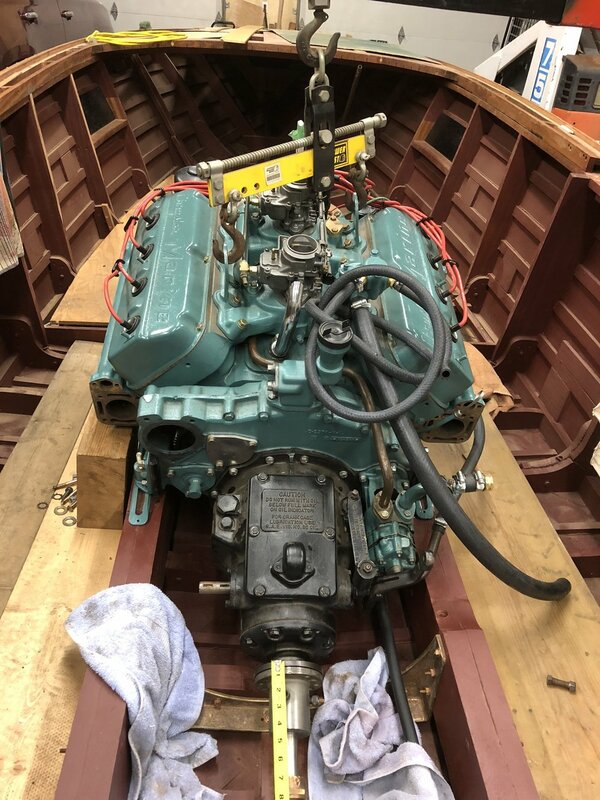 This engine was available in this boat as an option in 1956 which is the reason for this particular engine install to keep the boat period correct. Included in this mechanical restoration was a total rebuild of the transmission. All new bearings, bushings and clutch plates all trued. A glutton for punishment! This reno has taken way longer than expected because of other commitments and projects. Now looking forward to top deck and hatches, etc. 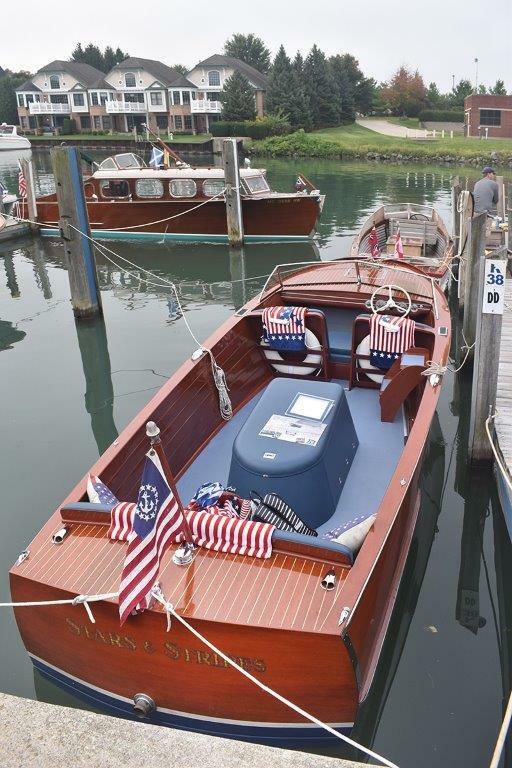 When Kieth needed a break from this boat he went full on restoring a 1954, 53’ Chris Craft Constellation! We will feature “Only You” next issue. I reached out to Bruce and Andrew Middleton at Boathouse Bay Classics/Absolute Classics to see what’s in their shop…..
On behalf of the crew of Absolute Classics Marine a Happy New Year to you all. Spring boating is just around the corner. For the Crew at Absolute Classics Marine 2018 has been a banner year, and with out question, one of the busiest we have had for many years which we feel bodes well for the hobby going forward. That said, we could not have accomplished the volume of work without a dedicated staff. It always astonishes me that Absolute Classics Marine was created nearly 30 years ago here in Kelowna and in some ways is responsible for the local classic boat culture and the OACBS. It began as a one man operation with a distinct mandate. 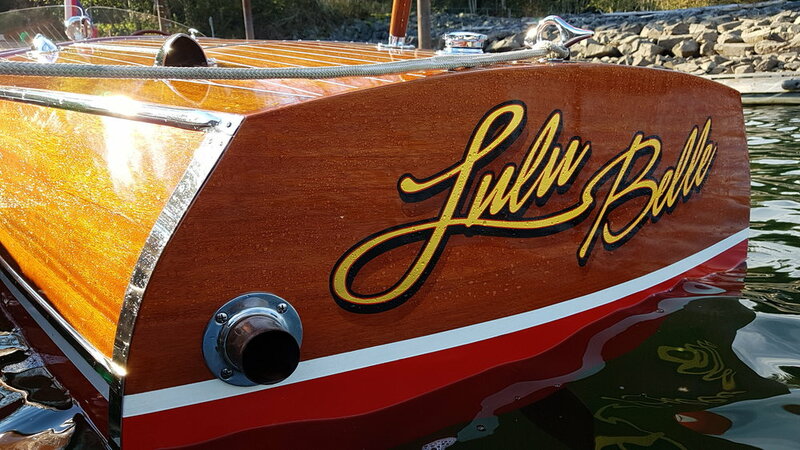 Create and maintain a stellar reputation restoring Classic Wood Boats for initially locals who valued this rather unique boating lifestyle. Over the years we have learned Classic Boat collectors worldwide are an exclusive bunch, seeking a connection to the boat they own and in turn taking immense pride in protecting the provenance and legacy of these truly magnificent watercraft. Secondly, every Classic boat owner has a story which most will gladly share. 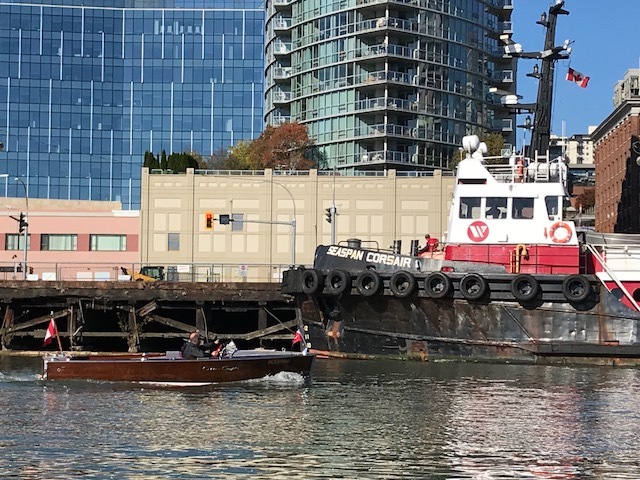 Clearly, whether the boat is a small skiff or a glossy speedboat, it has an ongoing history which serves to extend it’s legacy beyond the caretaker. Do you remember the movie, “On Golden Pond” with Henry Fonda and Kathrine Hepburn? The boat that appears in the movie is a 22’ Chris-Craft Sportsman which inadvertently is run up on the rocks in one “dreadful” scene. 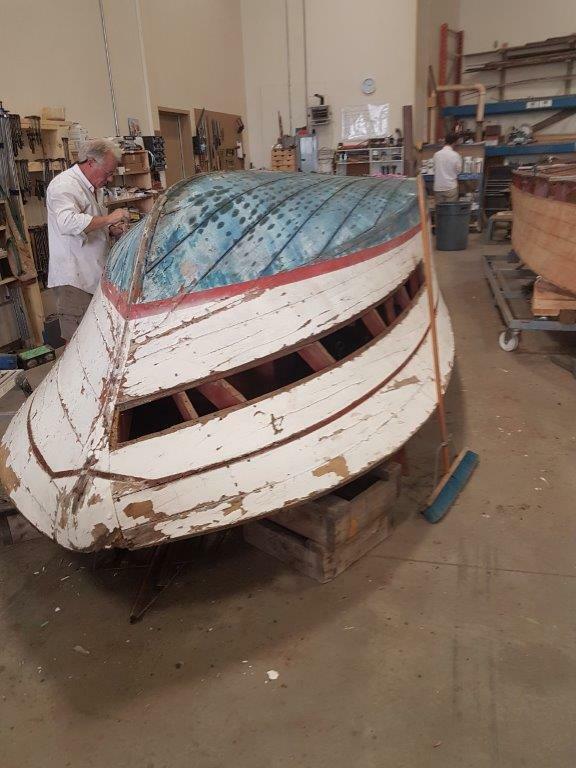 We are in the process of restoring one of these boats for a client who is in the latter part of his life much like Henry Fonda's character in the movie. 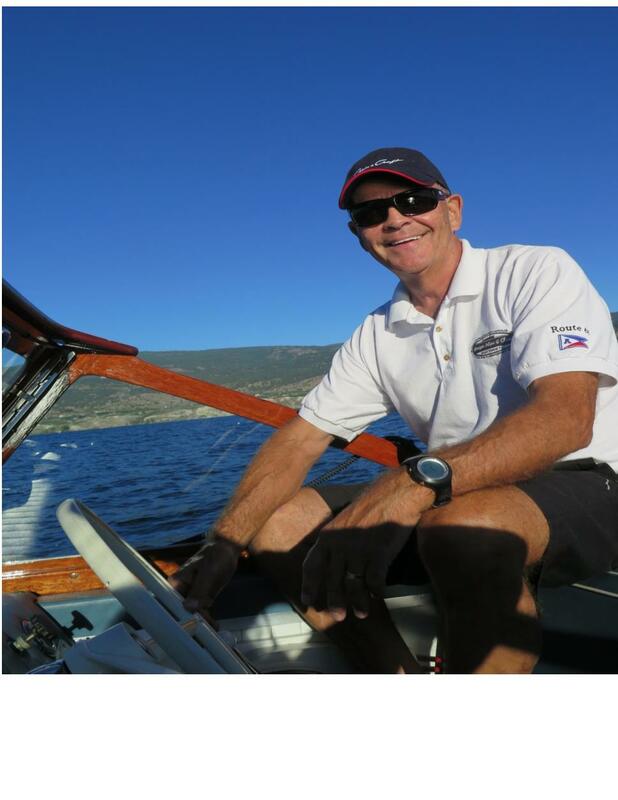 He wants to captain this boat for a few years on Lake Okanagan for the love of boating. After that, he intends to hire someone to skipper the boat for evening cruises for him and his wife. Above, 1947 Chris Craft U22 - 3 current pictures above showing new deck mostly and then the last is another U22 that it will look like when done. 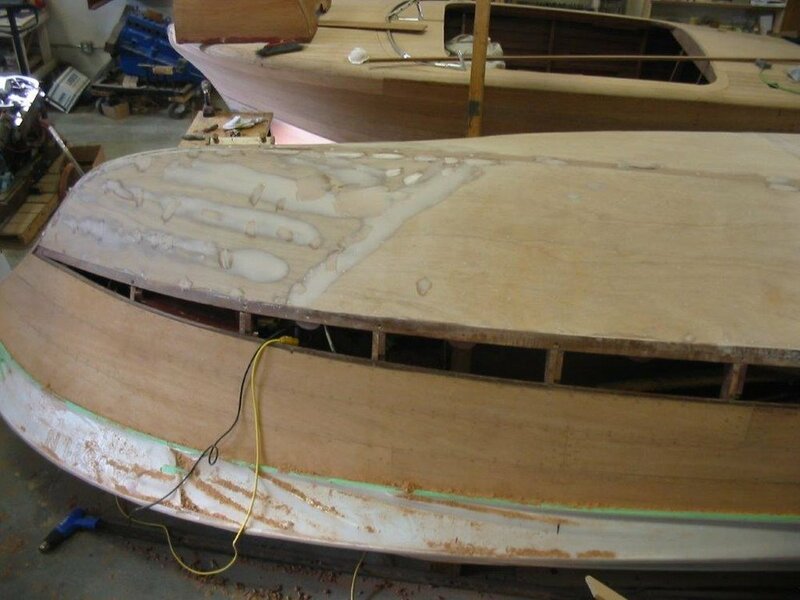 The restoration of a 1937 Chris Craft 19’ Custom is well underway. These are the fore-runners of the aptly named 'Barrelbacks'. A new bottom was installed and much of the original hull side planks were retained. The deck was in poor condition and as is often the case we had to correct the original frame layout to make the deck symmetrical. Chris-Crafts were production boats and although well built, were not always the same side to side. We installed a book matched deck and are very close to staining the entire boat. The first is a current photo above, second what it should look like when finished and third what we started with. 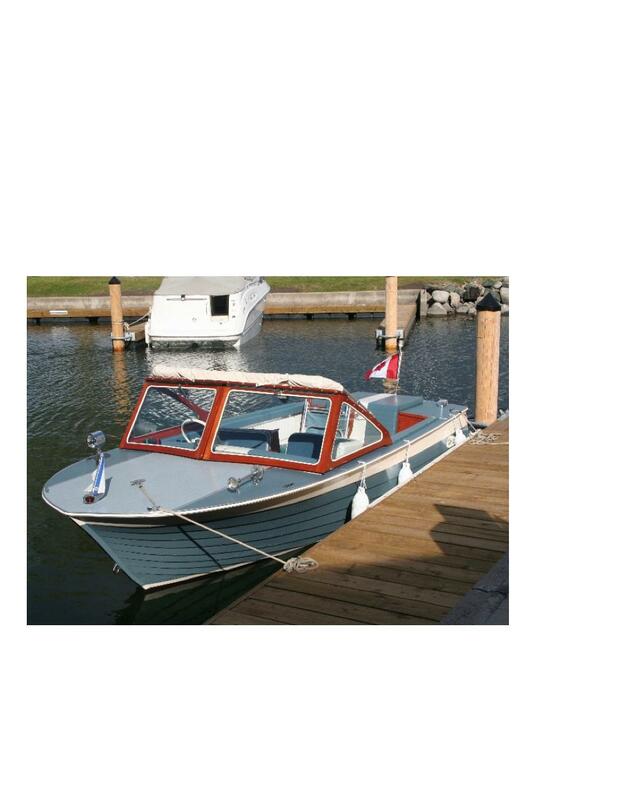 Shepherd Boats – these are highly coveted Canadian built boats and are quickly gaining the attention of collectors worldwide because of their styling and the quality of the build. We have restored many of these over time and currently have two underway. The first, above, is an early 50’s, 22 foot utility. 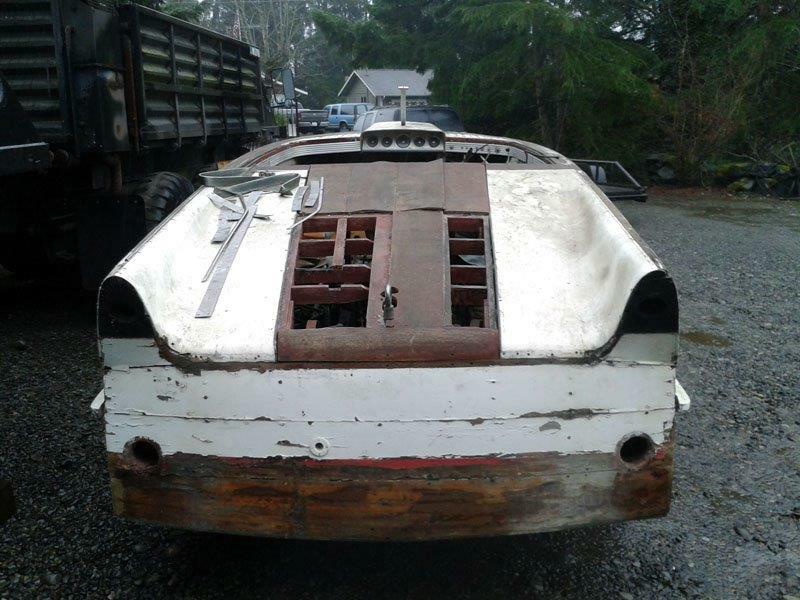 This has been a local boat for years and we recently arranged to sell it to an American client who wants it restored for use as Classic Cocktail Cruiser for his Lake Washington waterfront restaurant. The second Shepherd, below, is a somewhat rare model, the 16’ Ski Bee. Also a local boat for many years once owned by one of the clubs former directors Dr. Roger Ball. It is a V-Drive runabout, powered by a Chrysler Flathead 6 cylinder engine and is in for a refresh. Finned Chris Crafts. 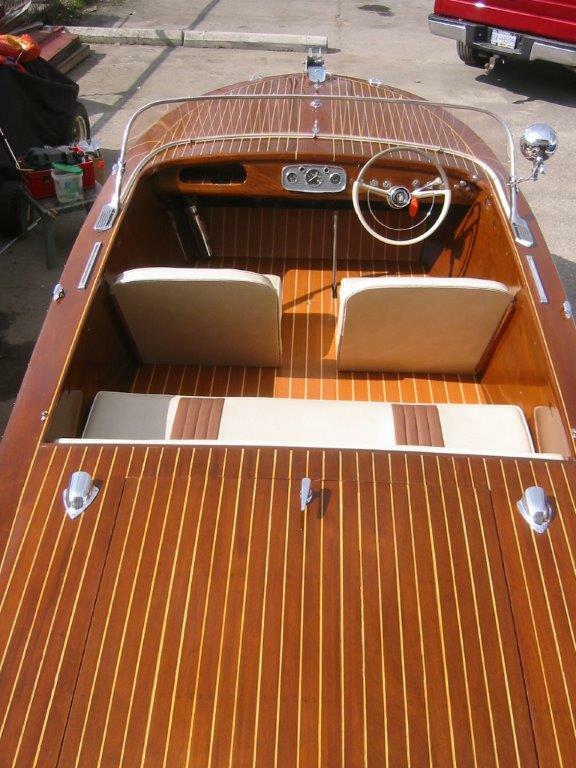 Last year we restored a 1958 21’ Chris-Craft Continental. This is a very stylish mid 50’s utility featuring twin fins aft of the rear seat. Chris-Craft was at the leading edge of design and was quick to adapt trends in the automotive industry. 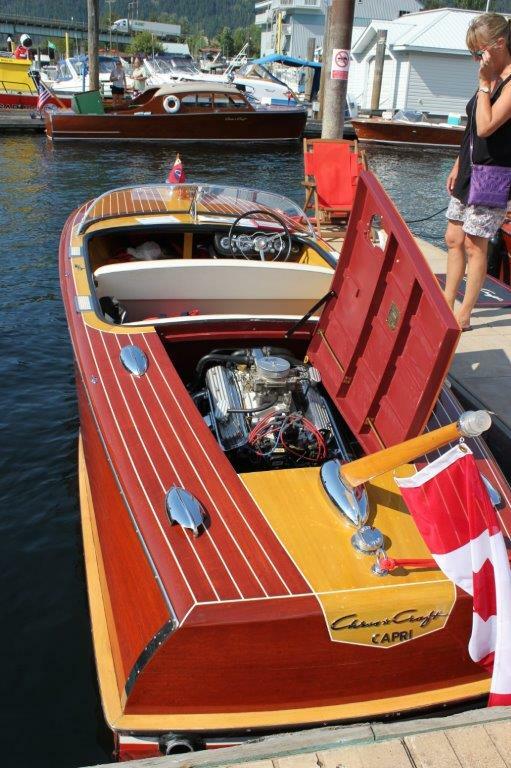 Another “finned” Chris-Craft soon to enter the Boatworks is a 1957 21’ Capri, pictured below. It is essentially the same boat as the Continental, but in a Runabout format. We are installing the original Cadillac 331ci V8 which was the most powerful V8 available in the mid to late 50’s. Luckily it is being restored for a client in the Shuswap so will hopefully be seen at some of our shows. Two boats we are just finishing up are a 1956 Chris Craft 19' Capri that has been a local boat for many years and at many of our shows - sadly we have sold this one, with some very interesting upgrades, to a client in Lake Havasu, Arizona. They are having us do some mild 'customization' on it including an expensive stereo system with a hidden built in Chart Plotter/GPS (apparently needed on Lake Havasu). The stereo controls are round and same size as the gauges so we have integrated them into the small dash 'pods' these bull nose CC's had - plus we made a duplicate 'pod' on the port side with a glove box covered in the same black alligator texture material with about a 12" gap/opening between them. Then our stereo guy is fabricating a mount for the Chart Plotter/GPS so it is inset and somewhat hidden so as not to take away from the original look of the boat. We also relocated the front seat back a bit in order to accommodate the new owners size - he's about 6'3 or so plus wanted the seat back bolstered so he could sit up on it. Then he wanted custom upholstery in Red with white piping. Then to top it all off he wanted extra fuel range so we custom designed a fuel tank to fit where the original went but almost doubling the capacity. We had to do that without taking the engine out so save him some cost. The boat also had a new deck installed and the hull sides and bottom refinished.and once the weather clears is heading south. 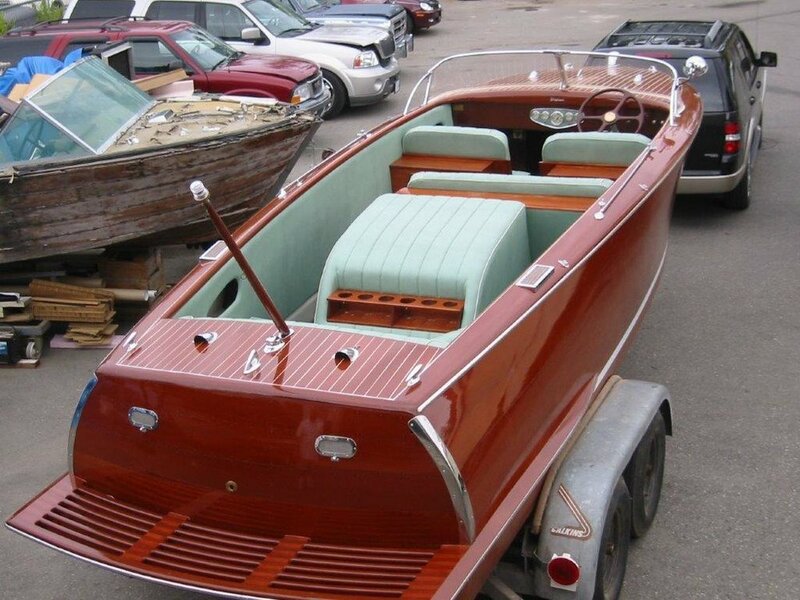 At almost the same time we are shipping the 1957 Chris Craft 23' Continental Hardtop to near Lake Tahoe California. Many of you might remember this boat at our recent show in Penticton. Since the show in September, we have removed the Hard Top and refinished it - removed the deck and replaced with new mahogany, removed the awkward and poorly upholstered front seat the previous owner installed in it (2nd picture) and Andrew & crew fashioned a near factory correct style seat to replace it. It will also get all new factory correct style upholstery in Red & white vinyl. Should look a 100 times better. As always we welcome all members and friends to visit and see whats going on in the Boatworks! Its always a “must stop” when your passing though Kelowna. Their shop is always filled with mahogany! Got something going on in your shop…. Dev and Wendy Fraser sent some great shots of the show boats out on the water. We just had to share them! We are now busy planning this years show! We want to build on last year’s success, increase attendance and plan more activities! If you are interested in helping, we are looking for volunteers to assist in planning (hopefully from the Okanagan), and anyone who wants to lend a hand at the show! To get involved, please contact any of our board members listed on our about page. October 14th and still boating! We were treated to some unusually warm weather and calm water this fall. I was born in the lower mainland but can honestly say I haven’t traveled along the river that often. Its an interesting perspective to see from the waterside. Louise and I went with Marty and Kylie and enjoyed one of the best boating days of the year! The weather was warm, and the water like glass. This was one of those special boating days that you savor because you know a warm day in October is a gift and the season is coming to an end. We launched in Maple Ridge at the Sylte Shipyard where they were just finishing a new tug boat. She’s a beauty! We headed west under the Golden Ears, Port Mann, and Pattullo bridges and puttered around New West Quay. They have a wonderful pier, shops, and restaurants but no place you can tie up! We then headed east back up the river through Port Coquitlam and on to Maple Ridge. Then it was over to Fort Langley where we docked and had a late lunch. There is a lot to see and the company was great! A very memorable day!